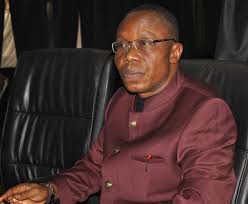 Strong Indications emerged Wednesday, that the Nigerian Police may Declare a Former General Superintendent of Assemblies Of God Nigeria Rev Dr Paul Emeka wanted over the case of Forgery pending against him. A Top Member of the Legal Department of the Nigerian Police Force told PUO REPORTS on Phone Wednesday Morning that the Inspector General Of Police Mr Ibrahim Kpotun Idris approved the arrest of Paul Emeka on Tuesday 16th November 2016. It was gathered that the development was leaked to Rev Paul Emeka who immediately arranged with his family to escape to a yet to be identified Location. Close allies of Paul Emeka did not deny that he had left Nigeria,but were ,mainly trying to align his emergency trip to a purported Lecture Invitation. Findings by PUO REPORTS showed that Rev Paul Emeka who was sighted at the Akanu Ibiam Airport in Enugu waiting for an Ethiopian Airline Left the Country Yesterday. Rev Paul Emeka may be running away from Nigerian in order to escape going to Jail.